View basket “The TileMaster Machine” has been added to your basket. The Aqua range offers small, compact, light-weight and robust carpet cleaning machines – perfect for spot cleaning but also powerful enough for the largest of jobs. 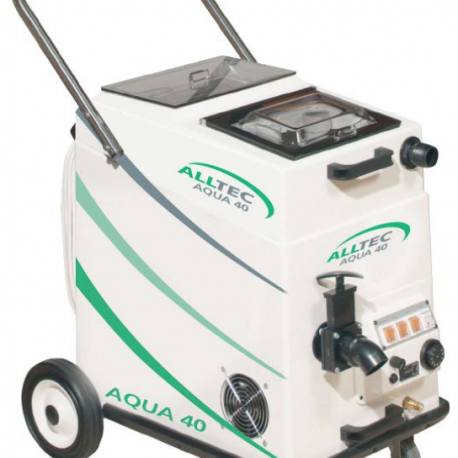 The Aqua 40 is the smallest of our range but still a powerful and professional hot water extraction carpet cleaning machine. For full details, see further down page. Interested in lease purchase? Your machine could cost you as little as £47 a month! Have a look at our leasing options here. Base price is for the Aqua 40 standard model machine only - please select from the available options to build your perfect machine! Choose your delivery option*?if you collect we will provide machine training free of charge! If you would like something different from the options available above please call us on 01763 208222 for a bespoke quotation. The Aqua range offers small, compact, light-weight and robust carpet cleaning machines – perfect for spot cleaning but also powerful enough for the largest of jobs. 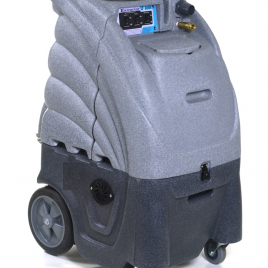 The Aqua 40 is the smallest of our range but still a powerful and professional hot water extraction carpet cleaning machine, with 100psi pump and single 5.7 3-stage vac as standard. Powerful enough to be your main cleaning machine, but also small enough to be ideal for the professional car valet, in-house cleaning crew or those with limited storage space. Fits in the back of most estate or hatchback cars, the large rear wheels and ergonomic folding handle enables easy load & off-load. This great little machine can be called upon to deliver outstanding results on carpets, rugs and upholstery. 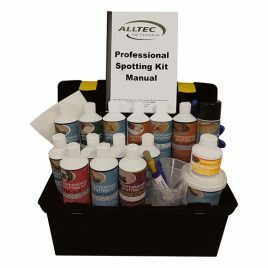 What else do you get when you buy an Alltec machine?! Choose from either a free solutions pack or a 1-day hands on training course worth up to £130+ VAT. PLEASE NOTE THAT MACHINES ARE ONLY AVAILABLE TO PRE-ORDER ONLINE AS EACH MACHINE IS MADE TO YOUR SPECIFICATION. 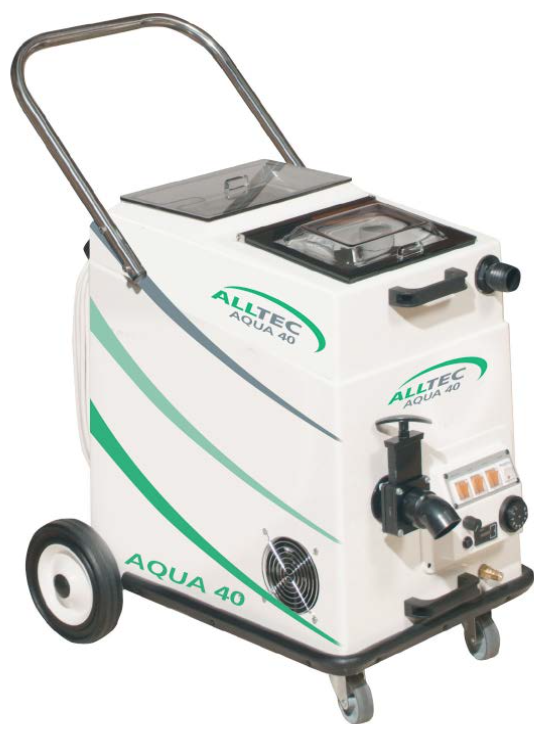 PLEASE CHECK CURRENT LEAD TIMES BY CALLING 01763 208222 OR EMAILING INFO@ALLTEC.CO.UK. *See our full T&C’s here. 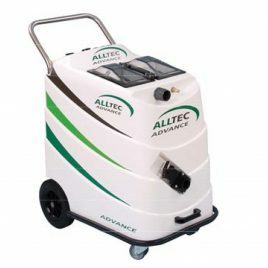 Our best-selling machine, the Alltec Advance 600 is an exceptionally powerful, large capacity, professional carpet & upholstery cleaning machine. 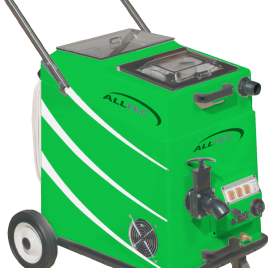 With adjustable 600psi pump, high air-flow, twin vac 5.7 vacuum motors as standard, optional triple vac upgrade, in-tank heater as standard, and large capacity tanks - all makes light work of both domestic and commercial cleaning. For full details, see further down page. Interested in lease purchase? Your machine could cost you as little as £84 a month! Have a look at our leasing options here. The Sahara range allows you to clean safely by using a mineral spirit (Alltec Dri-Sol). The machines are made more effective by gently heating the solvent. All our Sahara machines come with 7.5M solvent resistant hose assembly and a curtain cleaning tool, with optional upholstery tool available. For full details, see further down page. Interested in lease purchase? Your machine could cost you as little as £46 a month! Have a look at our leasing options here. The Rotovac 360i does not require a special high-pressure portable extractor to clean tile and grout. The Tile and Grout head uses a combination of rotary nylon cleaning brush bristles, spray jets and an outer vacuum ring to thoroughly clean and dry the floor. 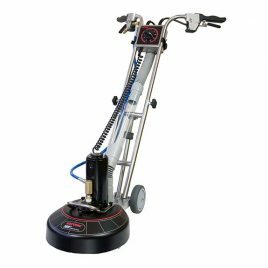 The Elite 1200psi is a powerful hard floor cleaning machine, allowing you to use truckmount add-ons such as the SX-range of hard floor cleaning tools, plus with it’s variable controls, you can still clean carpets and upholstery, making this a powerful all-round super machine! For full details see further down the page. Interested in lease purchase? Your machine could cost you as little as £77 a month! Have a look at our leasing options here.